Warner Bros. must have a lot of faith in its upcoming Vacation remake/reboot. The studio has bumped the comedy from it's October 9 release date, opening it a couple of months early. Vacation will now be a summer release, as it is scheduled to hit theaters in July. July 31, to be exact. This is seen as a bold movie, as the film will now be going up against heavyweight sequel Mission: Impossible Rogue Nation. Also opening on that day are the boxing drama Southpaw starring Jake Gyllenhaal, and The Gift, which marks the directorial debut of Joel Edgerton. Both Southpaw and Mission: Impossible Rogue Nation released trailers last week to much praise. 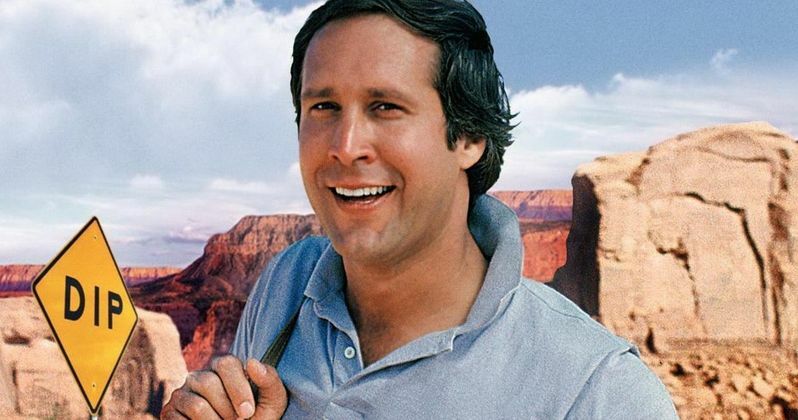 Vacation stars Ed Helms as Rusty Griswold, the grown-up son of Clark and Ellen. The story follows Rusty, his wife and two sons as they set off on their own road trip for Wally World. Christina Applegate will play Rusty's wife, with Chevy Chase and Beverly D'Angelo reprising their roles as Clark and Ellen. Also starring in the comedy reboot are Chris Hemsworth, Keegan Michael Key and Charlie Day. The original Vacation and the first sequel European Vacation both opened in the last weekend of July, which is why the remake/reboot moved. It is also said that test scores on the movie have been great. It will have been one month since Ted 2 opened in late June, with Vacation seen as perfect summer counter programming. The only other competition is the second weekend of Pixels starring Adam Sandler and Kevin James.